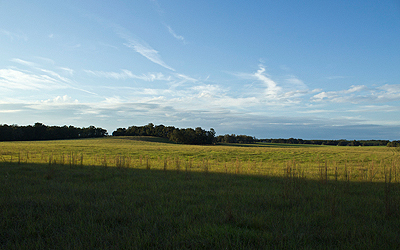 The outdoors in Old Florida are diverse featuring springs, rivers, rolling pastures, oak trees and pine forests. The Suwannee, Sante Fe and Ichetucknee Rivers provide fishing, swimming and boating in Rural North Florida, while springs offering recreation in the region include Suwannee, Little River, Royal, Charles and Falmouth Springs. 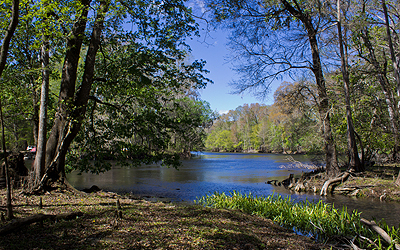 Suwannee River State Park offers cabins along the Suwannee River Wilderness Trail. There are also 30 campsites that can accommodate tents and RVs. Wes Skiles Peacock Springs State Park has two major springs, a spring run and six sinkholes. The park contains nearly 33,000 feet of underwater passages. It’s the longest underwater cave system in the continental United States. The Spirit of Suwannee Music Park and Campground is a unique music park and campground on the banks of the Suwannee River. The park hosts a variety of events each year in addition to live music in the music hall and outdoor festivals in the natural amphitheater. The park also includes a craft village, bat house, disc golf, canoeing, bird sanctuary, barn museum and more. The Stephen Foster Folk Center honors American composer Stephen Foster, who wrote “Old Folks at Home” a song which made the Suwannee River famous. The museum features exhibits as well as demonstrations of quilting, blacksmithing, stained-glass making and other crafts. Located on 40 acres is the First Federal Sportsplex. The regional park features five lighted fields, five lighted batting cages, five lighted bullpen mounds and two non-lighted asphalt tennis courts. There are also playground areas, covered and screened pavilions, walking trail, concession/restroom building, grassy areas and a 3,500 square foot skate park. Suwannee County Schools features five schools in Live Oak in addition to two schools in Branford within Suwannee County. The school district has one primary school, two elementary schools, an intermediate school, one middle school and two high schools. Suwannee-Hamilton Technical Center provides opportunities for the development of qualified workers for the job market. The center focuses on upgrading occupational skills and maintaining or advancing employment opportunities. Shands Live Oak Regional Medical Center is a 25-bed critical care facility providing care for over 50,000 residents in North Florida. Shands Live Oak offers acute care, diagnostic, emergency and outpatient services. The hospital is accredited by the Joint Commission on Accreditation of Healthcare Organizations. Suwannee County offers Florida’s most diverse agri-business communities and features industries from sawmills and poultry production and sales to crop production and distribution. Suwannee County was the 37th county established in Florida in 1858. Live Oak’s name comes from a large Live Oak tree which became a resting spot for workers of three major railways in the area. Live Oak averages rain on 84 days per year with over 50 inches of rainfall. The average high temperature is 82 with a low of 57.